Now I am going back to my French Ultramarine Blue and Burnt Sienna pigments. 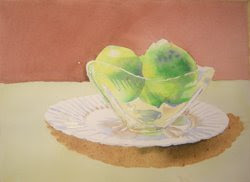 As a general rule, I either paint the shadows of an object first, or I work from large shapes, to smaller shapes with lighter values to darker values in the process. Here I am working to slowly develop the darker values, paying attention to color, value, shape, edges, all in relation to one another. Sometimes it is helpful to use small scraps of white paper and cover over the areas of the reference photo that you are not looking at. Expose only the small areas you want to see. Isolating the area often makes it easier to distinguish the shapes, values and edges, and helps increase the accuracy of your brushwork. You can see the blues and browns in the shadows of the plate and bowl. 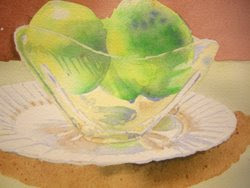 These objects are reflecting what is around them, so the colors used in the table, background and lemons, will all show up in some form in the shadows and reflections.